Last week, Netflix released a 10-part adaptation of Shirley Jackson’s 1959 novel The Haunting of Hill House. The show centers on the Crains, their five children, and the disturbing events that occurred during their time at Hill House. Straddling two timelines, each episode depicts the long-term effects of the experience on the kids, who are now adults struggling to make sense of what happened, and to cope with the suicide of their sister, Nell. If you’ve read the book and not seen the series, this description may have you a bit lost. And you would not be alone: As far as adaptations go, Netflix’s The Haunting of Hill House is less an adaptation and more of a gutting, all but looting the original book for its setting and character names and leaving the rest for dead. From the bottom up, almost every detail has been shifted and reimagined, to an extent that is almost baffling given how much Mike Flanagan, the series’ principal writer/director, already had to work with. In the book, the main characters are four adults brought together by a paranormal psychologist to investigate rumors of supernatural activity at the house. Unlike the show, not much is known about the former inhabitants of the mansion, save for a few details on the original builder. The book sticks to a single timeline, focusing on the unreliable perspective of the protagonist, Eleanor, and how she interprets the behavior of her peers and of the house. It often plays on the theme of uncertainty, exploring the little blanks our minds fill in when we are afraid (and what we choose to fill them with). The Haunting of Hill House is not about a physical haunting, with ghosts and otherworldly spectres. It is about the house itself as a living being, with motivations and thoughts of its own. It lashes out at its inhabitants from a place of sentience, but it is never known whether it chooses its victim, or its victim chooses it. Put that way, it becomes immediately clear how much the TV series strays from the source material, and how little regard its creators have for the impeccable nuance of Jackson’s work. The novel exhibits enormous restraint, serving as a metaphor for female repression while leaving much open to interpretation. There’s only one scene in the book where two characters verifiably experience the same phenomena; all other supernatural encounters are from Eleanor’s perspective and offer no definitive take on whether the incidents were real or the product of her mind. Many times, we’re led to believe that Eleanor may be having a breakdown due to her inability to function under the prospect of her own freedom, as evidenced by the book’s horrific ending. You’ll find none of this depth in Netflix’s version. What you will find is a group of vaguely attractive people brooding and occasionally shouting at each other on a set that’s more CGI than physical, revealing the extent to which Flanagan completely ignored Jackson’s central conceit. The house itself, while externally a fair depiction of the one described in the book, is smothered in moody gray clouds that seem to loom up from the foundation itself, an effect that is so overdone I laughed. This is a missed opportunity in terms of how the series is shot—the book focuses on the house’s unsettling angles, its impossible geometry, and how the fixtures and seams all seem just slightly off, as if it’d been built at 91 degree angles. Its architecture is the horror of the book, playing heavily into the characters’ perception of reality and Eleanor’s diminishing sanity without ever fully showing its hand. A director worth his salt would have leaned into the technical challenge and used it to underscore the book’s themes. Instead, the series is awash in cheesy post-production effects that turn Hill House into a chintzy, over-tweaked joke: It’s like cutting a cheese wheel with a chainsaw. The subtlety Jackson displays in the book makes many of the moments written for the series seem try-hard, almost hysterical. Dead kittens, ghostly spectres, a woman with a bent neck—these are all far too direct, and hokey and childish to boot. And what material the series does share with the book loses its impact in chaos of competing timelines and jump scares. What does the quiet terror of the “Whose hand was I holding?” scene count for, when the show has already bludgeoned us? Its impact is completely lost. Another scene, in the fifth episode, further illustrates how much the source material has been reworked with no understanding or consideration of its original context. Eleanor, or Nell (Victoria Pedretti), having found a tea set in the playroom, brings it to a comically sullen Mrs. Dudley (Annabeth Gish) and is told that one of the saucers, a cup of stars, used to belong to a former inhabitant of the house. In the book, however, the cup of stars isn’t physical, and its absence is integral to one of the novel’s most important metaphors. Eleanor, in the book’s earliest parts, steals her sister’s car in order to leave for Hill House, her first chance at freedom in her adult life following her mother’s long-term illness. As she drives through the small town surrounding Hill House, she observes many things that later become a part of her delusional inner fantasy world, details she stores in her memory and then plucks out at random when she impulsively lies to the other inhabitants of Hill House about her current and past life. Among them is an interaction in a diner, where Eleanor observes a young girl refuse to drink her milk because it isn’t served in her favorite “cup of stars.” Eleanor sees the girl’s defiance as a symbol of rebellion and silently cheers her on. When the cup of stars comes up again, it’s only in Eleanor’s fabrications, both to herself and others. It becomes a symbol of liberation and Eleanor’s desperate desire to belong, how much Eleanor wants both of those things but has no idea what to do with either, her feelings of displacement ultimately contributing to her death. The extent of the liberties taken with the book feels like a ransacking—one that might not have occurred if the novel or Jackson had been taken more seriously in the first place. 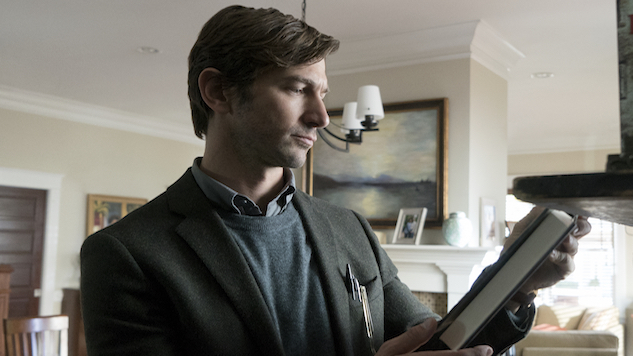 In the TV version of The Haunting of Hill House, Jackson doesn’t even get credit as the author of her own book: In the first episode, the novel makes a meta appearance as the work of the eldest Crain child, Steven (Michiel Huisman), a Michael Crichton type who writes pulp thrillers for an audience of unrefined tastes. The juxtaposition mischaracterizes the nature of her work, framing her prose as the product of Steven’s own cheap desperation, taking the most significant line of the book—“and those who walk there, walk alone,” a sentence as famous as the book itself—and trivializing it. In light of the frequent erasure of her career in the American literary canon, seeing her efforts attributed to a male author enrages me. Generally, I dislike speculating on what a deceased artist would think or do based on what I know of their work. Despite what Stephen King says, though, I find it hard to believe that the woman who wrote “The Lottery” would appreciate the schmaltzy wrap-up that concludes the Netflix adaptation of The Haunting of Hill House. And I think, like me, she would be horrified that Flanagan plucked the most significant line in the novel and transformed it into cheap, sentimental schlock for the sake of having a clean, happy ending (“...and where they walked, they walked together”). Imagine having the audacity to do that. Imagine doing that to any other work of literature. “It was the best of times… and it was the best of times. The end.” It’s appalling, and I suspect that Flanagan would not have done it if The Haunting of Hill House weren’t so often dismissed as “just” a ghost story, or if Jackson’s merit as a novelist received the respect it deserves. The most amazing thing about Shirley Jackson is her seamless ability to comment on social issues while exhibiting poise and restraint. That the woman who was capable of writing “The Lottery” could also write a horror novel like The Haunting of Hill House, without sacrificing her artistic sensibilities, is a testament to her ingenuity and versatility. All adaptations undergo changes to make the material suitable for another medium. I accept that. But this is egregious and disrespectful. The Haunting of Hill House was never “just” a ghost story, but this series is definitely “just” a TV show. Shirley Jackson deserved so much better.